Box Text: When monsters come to Aterra, so too did the Disciples: teenagers with rare abilities to hold the fiends back. Unique even among Disciples, your 100% success rate at producing Star Children blesses you with a special burden --- bond with female Disciples, raise an army, and help your world survive! Create Star Children and train them in one of 30 classes to form the ultimate fighting team! 12-23-2015 silverbow Box Text When monsters come to Aterra, so too did the Disciples: teenagers with rare abilities to hold the fiends back. Unique even among Disciples, your 100% success rate at producing Star Children blesses you with a special burden --- bond with female Disciples, raise an army, and help your world survive! Classmating Time Manage your relationships! The deeper your bonds, the stronger your Star Children. Family Bonding In the 3D labyrinths, teamwork is key. Exploit enemy weak points to chain them down! The Perfect Child Create Star Children and train them in one of 30 classes to form the ultimate fighting team! 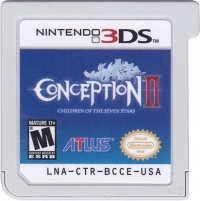 This is a list of VGCollect users who have Conception II: Children of the Seven Stars in their Collection. 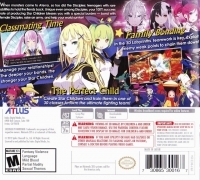 This is a list of VGCollect users who have Conception II: Children of the Seven Stars in their Sell List. 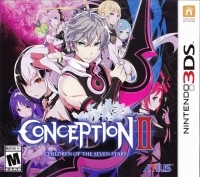 This is a list of VGCollect users who have Conception II: Children of the Seven Stars in their Wish List.